PanARMENIAN.Net - A major exhibition titled "Armenia!" 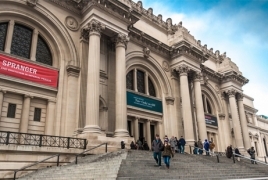 which will open at the Metropolitan Museum of Art in New York on September 22 and run through January 13, 2019, emphasises how Armenians developed a distinctive national identity in their homeland, Apollo magazine says in its recap of the upcoming event. "Celebrating the arts and culture of the Armenian community from their conversion to Christianity in the fourth century to their leading role in international trade routes in the seventeenth century," the magazine says. "This exhibition emphasises how Armenians developed a distinctive national identity in their homeland and how they maintained and transformed their traditions as they travelled crossed the globe. "Opulent gilded reliquaries, illuminated manuscripts, rare textiles, liturgical furnishings, khachkars (cross stones), church models, and printed books demonstrate Armenia’s distinctive imagery in their homeland at the base of Mt. Ararat and other major Armenian sites, from the Kingdom of Cilicia on the Mediterranean to New Julfa, in Safavid Persia. More than half of the works on display are on loan from The Republic of Armenia."